and she asks herself, "can you do the can-can?" Anna Maria did it. 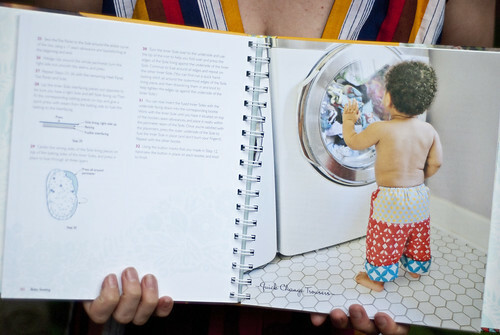 She wrote a sewing book that is both beautiful and practical, and one that makes you want to have more babies. It's the first of its kind. 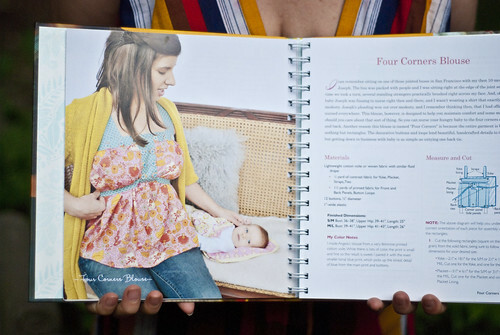 I predict a baby boom among the sewist crowd after Handmade Beginnings is published. Watch out, Finn - there are at least five more siblings in your future now that I have this book in my hands! 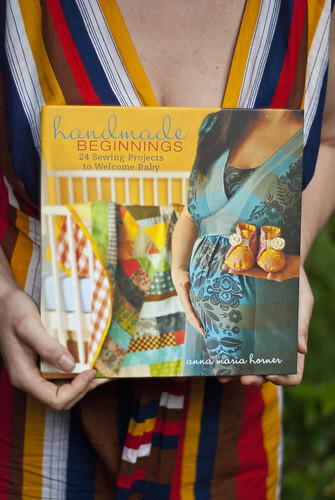 Handmade Beginnings: 24 Sewing Projects to Welcome Baby is such a special book because Anna Maria has shared so much of herself throughout its pages. Her sixth pregnancy, her newborn, her children, her home - as you flip through its pages, you feel as though you're hanging out with a friend. 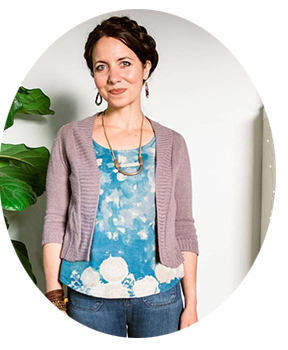 A friend who also happens to be an experienced mama and seamstress. (I figure that, after the sixth baby, you've reached a certain level of expertise that was completely lacking for number one. I remember that first night we had Finn at home alone. Patrick and I just stared at that messy diaper like "What the heck are we supposed to do with that?" The diaper fairy never came. We managed. At any rate, it's so nice to have the friendships of experienced mamas to get you through those challenging "firsts!" So, I found myself trusting Anna like one of those mama-friends. 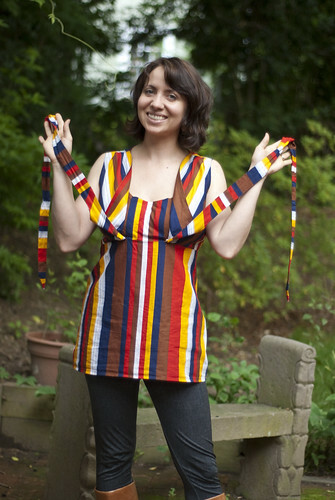 Anna wrote, in the introduction to the Mariposa Dress and Tunic project, "The transformation that you and your body will experience during and after pregnancy is nothing short of a gorgeous wonder. Ignore any thought that has you feeling otherwise." Yes! It has been an adjustment to come to view my life-creating and life-giving body, with it's extra belly skin and hard-earned stretch marks, as the "gorgeous wonder" that Anna Maria talks about. But you know what? It is. 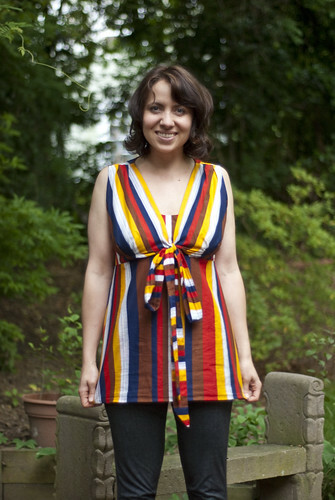 And the Mariposa Tunic, which you can make in either a maternity version or a post-baby, nursing version, really flatters the mama body. I made mine in a lightweight cotton lawn, using the vertical lines of the fabric to create a lengthening effect along the torso. 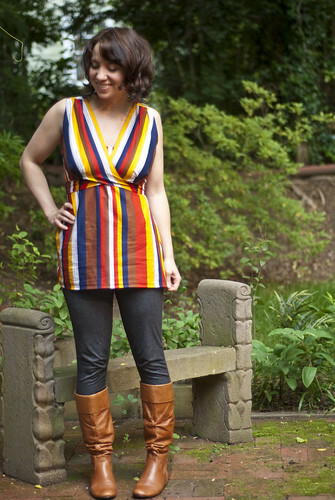 I love the styling - the gathering at the shoulders and the lower bodice works well for fuller-busted, nursing mamas, and it's very comfortable to boot. 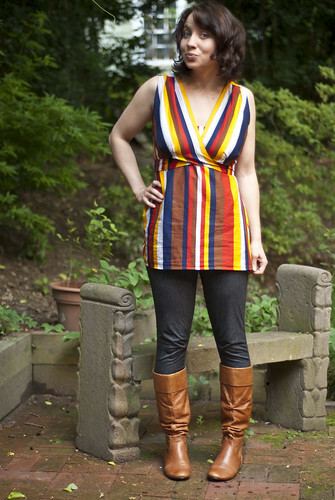 My sleeveless version started out as a dress, but like many of my would-be dress projects, it morphed into a tunic. The pattern itself is extremely well written, with very clear diagrams. It was fun to sew, and I worked it up in about five hours or so. 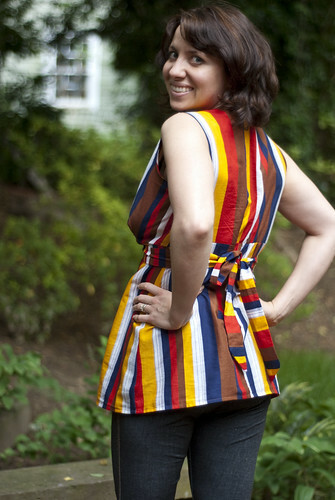 A few pattern notes - because I made the sleeveless version, I ended up bringing in the side seams underneath the arms. I don't have a very broad back, but I suppose that, had I made the version with sleeves, I wouldn't have had to make this adjustment, as sleeves do require some extra space for arm maneuverability. The only bummer about this pattern (and the other maternity/nursing patterns in the book) is that the sizes are limited to Small, Medium, and Large. I wear a Small/Medium in the tunic, so I can imagine that the sizing is a limiting factor to many women. It's the nature of patterns-in-a-book, though - you can only fit so much on those little paper inserts. The brilliant modesty panel makes for super-easy nursing access. I tried it out for lunch on the town, and sure enough, nursing discreetly was a cinch. Finn approves. It's also versatile! Quickly tie it in the front after nursing for a sweet look. I'm not done yet! I'm off to find some fabric to whip up the Four Corners Blouse, and I've already cut the fabric to make Finn a pair of Quick Change Trousers with a modification for his large, cloth diapered bum. And how can I resist the Baby in the Hood Jacket? The fabric is all lined up for this one, too. 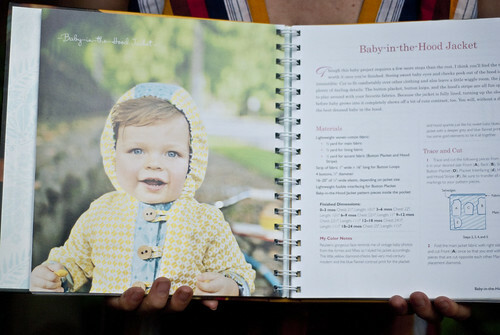 To see more of the book, check out this preview. Check out the other book tour stops when you get the chance!